We had a bunch of snow this week in Minnesota. Blue gets very frustrated this time of year because we aren't quite as excited to do things like take him for walks, go to the lake or to the dog park. He has to settle for me putting on a coat and throwing the ball in the backyard for awhile. Needless to say, he isn't very happy about it. Our albino squirrel friends have to be excited to have snow on the ground because they blend in much better so the hawks and eagles can't see them. This little guy needs to stop rooting around in the mud so much though, otherwise he's going to lose his advantage. Miss Sheri loves Christmas so she was ecstatic to have the opportunity to meet one of Santa's official reindeer at a local bank. I thought about telling her it's not a real Santa reindeer, but didn't want to break her heart. 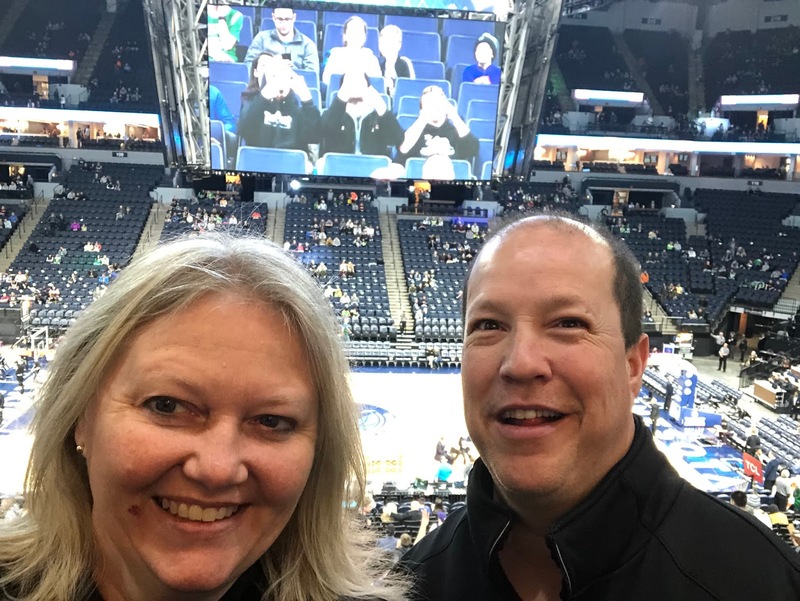 On Saturday night, we drove through a blizzard to go to Target Center to see our Minnesota Timberwolves take on the Boston Celtics. We debated if the snow was going to be too scary to make the 45 minute trip, but ultimately decided to go for it. Glad we did, because it turned out most of the snow had already passed by the time we got on the roads. We were raring to go to watch some good basketball. The last time we went to a Timberwolves game, Jimmy Butler was still one of our star players. That is no longer the case as Butler was traded for Robert Covington as well as Dario Saric and Jerryd Bayless. The trade has worked out well for the Wolves so far as they've won 7 of 9 games since it was completed. Karl Anthony Towns seems much happier about things now that Butler is gone. It's back to being his team again and all the drama is gone. Now they just have to keep winning. Former President George H. W. Bush died the night before the game and the Timberwolves had a nice moment of silence for him before the game began. He was a good man. May he Rest in Peace. At halftime, they promised a special treat and we were pleased to see a former America's Got Talent contestant do his balancing act for the crowd. It's pretty crazy how this guy climbs an ever escalating tower filled with large pipes that roll back and forth while he's trying to balance up there. I have no idea how you discover that you have a skill like this, but I'm not going to check to see if I can do it. Unfortunately for the home team, the Celtics proved to be the better team that night and ended up winning the game by a score of 118-109. It was a fun game to watch, though, and I am excited about the team's future. We'll see how they continue to gel with their new players.